Decades of planetary exploration have revealed widespread evidence for ancient aqueous activity on the surface of Mars, including hydrous alteration minerals, deeply incised valleys, paleolake basins, and fluvio-lacustrine sedimentary deposits. In this talk I will provide an overview of the various lines of evidence for water on early Mars, and discuss outstanding questions on the details of the ancient martian surface environment. I will also present recent work aimed at reconstructing the evolution of a delta deposit within Jezero crater, the landing site for the next NASA rover - the Mars 2020 mission. The Jezero delta is also a representative example of ancient fluvial stratigraphy on Mars, and so these results can help to improve our understanding of the early martian climate and hydrologic cycle. Tim Goudge is an Assistant Professor in the Department of Geological Sciences within the Jackson School of Geosciences at the University of Texas at Austin. Dr. Goudge’s scientific interests focus on the role of surface processes in controlling the evolution of planetary landscapes. His research uses remote sensing data to study the signatures of these processes recorded in the topography, mineralogy, and sedimentary rock record of Mars, Earth, and other planetary bodies. Dr. Goudge received a BSc in geological engineering from Queen’s University, and a ScM and PhD from Brown University. This event will include poster presentations from the top student posters from the Jackson school and from the Austin Regional Science fair, and will include a cash prize for the winners in each category. This will likely take place again in the BEG multi purpose room. Many mountainous landscapes are mantled with thin soils that overlie meters to tens of meters of weathered bedrock. This transition zone between soil and bedrock often controls how infiltrating water is partitioned between evapotranspiration and runoff, as well as the rate and pattern of chemical denudation in a landscape. Despite this region’s significance to hydrologic and geomorphic processes, it is largely invisible to observation and the geochemical reactions and hydraulic properties that govern its structural evolution over time are poorly constrained. In this talk, I will present results from an intensive effort to directly quantify the complex fluid and solute pathways in the weathered bedrock region at the Eel River Critical Zone Observatory (ERCZO). We have instrumented an 18 m thick variably saturated argillite weathering profile in the uplifting Northern California Coast Ranges with a series of flexible sensors and samplers that span the continuum from soil to fresh bedrock. In the seasonally dry setting, we observe significant hydrologic dynamics within the weathered bedrock region. Wet-season rainfall passes through unsaturated fractured bedrock before reaching the groundwater table and running off to the adjacent stream. The water that is seasonally stored in the weathered bedrock (rock moisture) is used by plants for transpiration. Using our sampling system, we have collected nearly two years of bi-weekly major and trace ion chemistry from samplers distributed within the weathered bedrock region that separately collect freely draining and tension-held water. We compare water chemistry to in-situ water content and gas phase O2 and CO2 , as well as rock characterization data such as bulk density and elemental composition, to identify controls on the observed solute concentrations. Our preliminary results reveal that both the freely-draining and tension-held waters are seasonally geochemically dynamic, while these same dynamics are dampened or absent in groundwater and streamflow. The tension-held samples show consistently higher concentrations relative to freely draining fluid, suggesting that the dual-domain nature (i.e. flow through matrix and fracture components) of the weathered bedrock system significantly impacts solute generation and weathering of bedrock. We compare our field observations to preliminary 1D reactive transport simulations to explore the role of dual-domain transport on weathering reactions. Our results highlight the coupled nature of geochemical and hydrologic processes in weathered bedrock and the importance of studying this region in Earth’s Critical Zone. Daniella Rempe is a hydrologist and geomorphologist interested in understanding how the evolution of the near-surface environment drives hydrologic and ecologic processes. She uses a diverse set of hydrological and geophysical field techniques to probe the interior of hillslopes to understand how surface and subsurface processes influence water resources to vegetation, rivers, and the atmosphere. Learn more about Daniella's research interests on the webpage “Rempe Research Group”. The Edwards Plateau and the Balcones Fault Zone (BFZ) dominate the geology and physiography of Central Texas. The Edwards Plateau was formed during Early Miocene time by uplift of the area west and north of the arcuate BFZ. 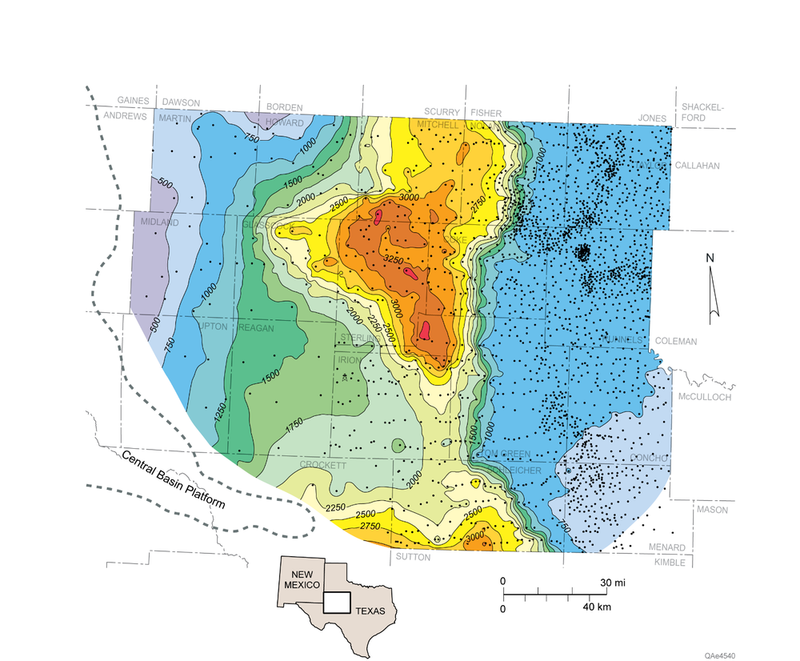 The Albian Edwards Group was a continuous sheet of resistant shallow-shelf carbonate strata that covered all of central Texas: the Edwards Plateau, BFZ, and subsurface of the Central Texas Platform. 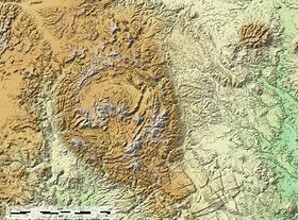 At the time of first Balcones faulting, the Edwards was widely exposed west and north of the BFZ. Regional headward erosion and dissolution following Balcones faulting progressively stripped away Edwards strata, leaving steep, ragged bluffs that delineated the boundaries of the Edwards Plateau. Just as geological maps outline the Edwards Plateau today, a reconstruction of past Edwards Limestone outcrop locations records the stages of westward and northern erosional retreat through Miocene, Pliocene, Pleistocene and Holocene times. Seven paleogeographic maps of the Edwards Plateau/BFZ area from onset of Balcones faulting (21 mya) to the present time, showing the location of the Edwards Plateau and the courses of all main streams, in 3.5 my stages. Incised meanders of Edwards Plateau rivers and streams, inboard and peripheral to the BFZ, were probably inherited from early Paleocene conditions, then greatly amplified by Balcones-related uplift. High porosity and permeability of Edwards strata in the central sector of the BFZ and Edwards Underground Aquifer is related to a) a longer period of increased stream gradients and stream piracy in that sector; b) a wider BFZ with greatest vertical displacement; and c) the presence of a major discharge point at the lowest elevation in the trend, at San Marcos Springs. Between 14 and 10.5 mya, the Colorado River formed its Great Bend, when it shifted its course about 35 miles north and east, after eroding through Cretaceous strata, downward onto hard, northeast-dipping Paleozoic beds. This shift also generated the marked asymmetry of the Colorado drainage basin, with short tributaries on the east, and long straight tributaries on the west. Multiple levels of horizontal cave development (youngest downward) in the western Edwards Plateau suggest that the thickness of the Edwards Plateau aquifer was greatest immediately following Balcones faulting, and declined afterward in stages as erosion reduced the area of surface recharge, and increased outflows. The post-Balcones Medina Arch induced concave-upward stream profiles in streams originating around its apex: Pedernales, Blanco, Guadalupe, Medina, Frio, and East Nueces Rivers. Dr. Pete Rose (Ph. D., Geology, University of Texas, Austin) has been a professional geologist for 59 years, specializing in Carbonate Stratigraphy, Petroleum Geology, E&P Risk Analysis, and Mineral Economics. Before going on his own in 1980 as an independent prospector and consultant, he worked for Shell Oil Company, the United States Geological Survey, and Energy Reserves Group, Inc, a small-cap Independent. After 10 years as an internationally-recognized authority on economic risking of exploration drilling ventures, he founded Rose & Associates, LLP, in 1998. His 2001 book, Risk Analysis and Management of Petroleum Exploration Ventures, now in its 7th printing, is considered by many as the “Bible” on that topic, and has been translated into Chinese, Japanese, and Russian. Pete retired in 2005; Rose and Associates LLP continues as the global standard among consulting companies in that field, providing instruction, software and consulting services on an international scale. Pete wrote the definitive geological monograph on the Edwards Limestone of Texas (Rose, 1972), and has continued related investigations to the present time -- this will be his 10th published paper on various aspects of the Edwards Plateau area. 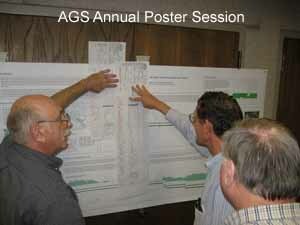 He has authored or co-authored more than 80 published articles on an extremely wide variety of geological topics. He was a Fellow of the Geological Society of America, the American Association for the Advancement of Science, and Geological Society of London. In 2005 he was the 89th President of the American Association of Petroleum Geologists, In 2006-07 he was deeply involved in successful efforts to encourage the U. S. Securities and Exchange Commission to modernize its rules governing estimation and disclosure of oil and gas reserves, thus facilitating the investment component of the “shale revolution” in the U. S. Pete ws President of the Austin geological Society in 2012/13. In 2013, the Geological Society of London awarded Peter R. Rose its prestigious Petroleum Group Medal for lifetime contributions to Petroleum Geology, the first American to be so recognized, and in 2014 the American Association of Petroleum Geologists honored him with its Halbouty Outstanding Leadership Award. Wednesday, December 5th, 2018, 9:00 a.m. - 3:00 p.m. 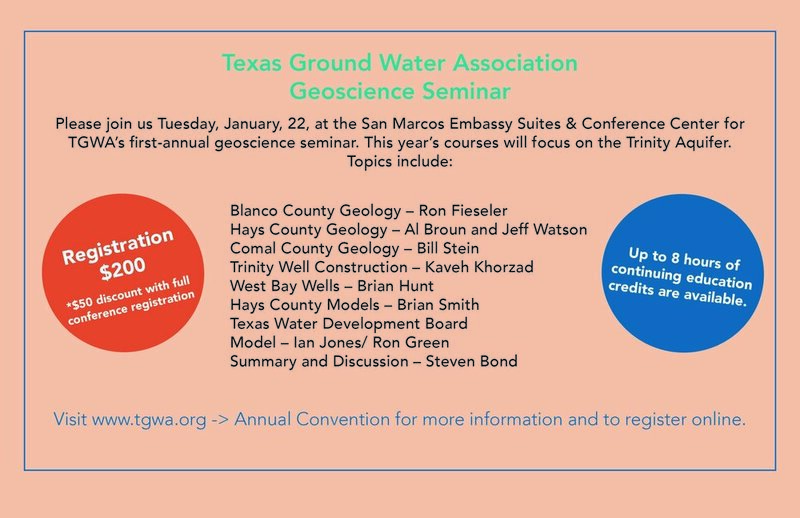 This all-day workshop is an in-depth study of Wilcox Group stratigraphy and depositional systems in Texas based on detailed analysis of more than 1000 well logs and about 900 km2 of 3D seismic data. Attendees will receive a hands-on view of 5 key cores with an extensive review of depositional environments – fluvial, deltaic (wave, tidal and fluvial processes) and upper slope facies. Core descriptions, cross sections and lithofacies maps document temporal and spatial variations in shoreline processes from wave-modified and tide-influenced to wave-dominated deltas and indicate that significant volumes of sandstone were trapped on the outer shelf by contemporaneous growth faults. However, at times the Wilcox shelf margin prograded through mud accretion. Mud-rich shelf to slope transitions documented from cores and seismic data show that significant basin margin progradation can occur in the absence of coarse-grained sediment. Mexico has a young geologic history, the oldest basement (Grenvillian) near the Gulf of Mexico has been rapidly accreted along the western margin since Mesozoic time. The accreted island arcs and the related subduction, magmatism, and tectonism created an ideal regime for the emplacement of world-class metals deposits. Mexico has about 7 Metallogenic provinces, wherein the different metal deposits share chemical and structural characteristics. The world’s largest primary silver mine in Fresnillo is at the heart of the Altiplano Silver Province. Running along the western half of Mexico for nearly 1,300 kilometers, exists the largest tertiary volcanic province in the world. More than 250 calderas have been identified in the province that is characterized by a 1,000+m thick rhyolite series which overlies intermediate volcanics. Rapid extensional opening of the Gulf of California (only 8 Ma) served to dissect this terrain into extreme canyons (called barrancas). In southwest Chihuahua State, there is an extensional juncture that created a “super barranca” which is known as the Cuenca de Oro (CDO), due to the occurrence of gold and silver along its margins. This region is federally known as Copper Canyon (CC) and it rivals the Grand Canyon (GC). The CC is much steeper than the GC and vegetation ranges from pine trees on the high plateau to tropical brush in the valleys, often more than a kilometer below. El Sauzal, along the northern margin of the CDO, was the largest gold mine in Mexico when constructed in 1998 and was successfully decommissioned in 2015 after producing more than 2 million ounces gold. Batopilas, 20 km east of Sauzal, was discovered by the Spanish in 1632 and has produced more than 250 million ounces silver. Several projects along the southern margin of the CDO are in early exploration stages. The Cerro Cascaron Project is being drilled by Harvest Gold currently. The Don Chano Project is located 40 km South of El Sauzal & Batopilas, the land position consists of a federal mineral claim, covering 1,413 hectares (3,492 acres) in the Municipality and Ejido of Morelos, Chihuahua. Mineoro has collected approximately 600 measured-width bedrock samples over the Don Chano Project. High-Grade vein targets and large disseminated bodies of precious metal mineralization have been identified; maximum Gold value of 167 ppm Au w/ 132 ppm Ag encountered at Pacheco; maximum Silver value of 2,130 ppm Ag w/ 18.4 ppm Au sampled at Guadalupe. Visible gold has been confirmed from 2 locations (600m of strike) along the Tres Mujeres Vein Swarm. Mike started performing geologic work in Mexico about 12 years ago. As an economic geologist he has primarily focused on the early stage exploration of metallic and hydrocarbon deposits. He has operated as a consultant for numerous public and private mineral exploration companies in Mexico and the western USA. Also served as a Geologist, Petrophysicist, and Database Administrator for Oil & Gas E&P Companies operating in the Midland and Anadarko Basins of Texas and Oklahoma. Born and raised in Houston, TX he caught the “gold bug” while completing his BS at Sam Houston State University in Huntsville, TX. West Texas was calling and his passion for mineral specimens and hard-rock geology were cultivated at the University of Texas at El Paso, where he focused on Economic Geology under the tutelage of Dr. Kenneth Clark and Dr. Philip Goodell. His MS thesis presented a geologic traverse from Upper Volcanic Series (Bolivar Mine, DiaBras) through Lower Volcanic Series (El Sauzal, successfully decommissioned by Goldcorp in 2015) and into Batholith (Choix, Sinaloa). The Cuenca de Oro (Basin of Gold) is an extensional basin with numerous precious metal deposits exposed along the periphery, this study provided context for the Western half of the CDO. Networking in the mining industry led to securing funding for a Doctoral Study on a historic gold mining district that was being re-evaluated and drilled. A project-specific deposit model was created for the district from the integration of: field mapping (stratigraphy, structure, alteration, and quartz textures), geochemistry, fluid inclusions, stable isotopes, and age dating. The High Grade District in Northeast California was drilled as the “Golden Ridge Project” and highlights of the 3,500m drill program include a 5' high grade (120 ppm Au) zone and a 30' interval grading 25 ppm Au. MineOro Explorations is an operating entity that provides: mapping (geology, alteration, under-ground), geochemistry (prospecting/grid), technical reports, due diligence reviews, native relations, permitting, drilling, 3D modeling, and project management services. We have successfully operated in some of the rougher locales, where native engagement and relationships are paramount to any advancement. Mike uses a strong network of contacts and actively explores gambusino leads. Mineoro has also operated with a prospect generator business model, in which mineral projects are vended to explorers that will fund drilling and development. The Chloride Gold Project in NW Arizona has been vended and drilling should commence in short order. A notable current work is the boot-strapped discovery of the Don Chano Precious Metal Prospect in SW Chihuahua (along the southeastern rim of the Cuenca de Oro). More than 5 bonanza grade structures have been defined by bedrock sampling within the 4 x 1 km footprint. This stratiform deposit has never been drilled and nearly 600 measured width chip samples show strong precious metal activity across the footprint. The project is drill-ready and shares numerous characteristics with other world-class deposits. 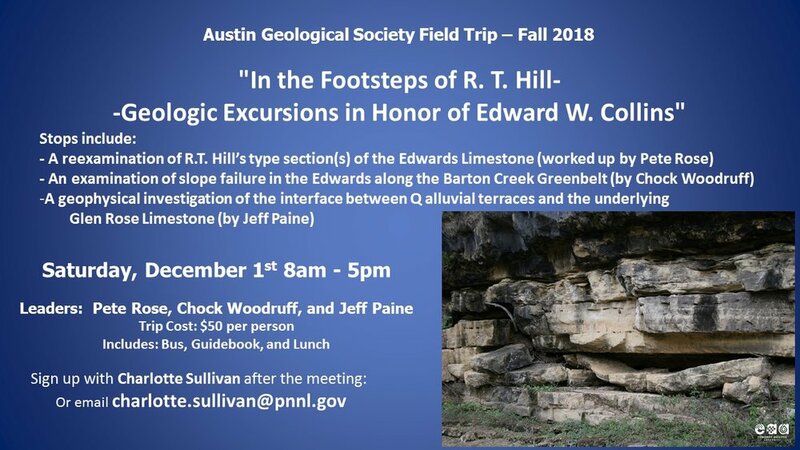 Dec. 1, 2018: AGS Field Trip: "In the Footsteps of R. T. Hill--Geologic Excursions in Honor of Edward W. Collins"
-Geologic Excursions in Honor of Edward W. Collins"
Investigating past variability in South American hydroclimate is pertinent to understanding how hydroclimate might respond to global climate change. δ18O records from South America provide insight into past variability of the South American Monsoon System (SAMS). Precipitation δ18O values, however, can be decoupled from local moisture conditions at a given site and, thereby, limit ability to reconstruct local moisture conditions. In this study, we investigate the coherence of Holocene δ18O records from across tropical and subtropical South America using a principal components analysis and assess the co-variability of reconstructed SAMS variability with local moisture conditions reconstructed from speleothem 87Sr/86Sr values. The main mode of variability across Holocene δ18O records (PC1) closely tracks changes in austral summertime insolation, consistent with existing work. Sites towards the periphery of the continent are heavily weighted on PC1, whereas interior sites as not. Further δ18O variability at interior sites bear little similarity to each other and implicate controls, beyond monsoon intensity, on these δ18O records. Further, we develop speleothem 87Sr/86Sr records spanning the Holocene from Tamboril Cave (Brazilian Highlands), Paraíso Cave (eastern Amazon Basin), Jaraguá Cave (Mato Grosso do Sol Plateau), and Botuverá Cave (Atlantic coastal plain) to investigate coupling between reconstructed monsoon variability (reflected by PC1) and local moisture conditions (interpreted from 87Sr/86Sr records). Speleothem 87Sr/86Sr variability is interpreted as a proxy of local moisture conditions, reflecting the degree of water-rock interaction with the cave host rock as driven by variations in water residence time. Speleothem 87Sr/86Sr records from all the sites, except Botuverá cave, do not co-vary with PC1, suggesting that local moisture conditions do not necessary follow variations in monsoon intensity at these interior sites. These speleothem 87Sr/86Sr records, however, generally suggest dry mid-Holocene conditions relative to the early- and late-Holocene, consistent with interpretations of other paleo-moisture records in the region. These results highlight that controls, in addition to SAMS variability, might influence δ18O variability as well as local moisture conditions at interior sites, and stress the need for δ18O-independent reconstructions of moisture conditions. Dr. Corinne Wong is an environmental isotope geochemist who studies modern cave environments to understand how past climate can be interpreted from speleothem cave deposits and reconstructs past hydroclimate from speleothem isotopic and geochemical variability in the western United States and the region of the South American Monsoon System. Corinne was an Environmental Protection Agency STAR Graduate Fellow at The University of Texas at Austin, a University of California Chancellor’s Postdoctoral Fellow in Davis, California, an Assistant Professor at Boston College, and Research Associate at The University of Texas at Austin. Complex rock fabric, composition, pore structure, and geochemistry make formation evaluation of unconventional resources extremely challenging. The conventional rock physics models and formation evaluation methods often do not quantitatively take into account the aforementioned complexities in rock properties, which lead to unreliable estimates of reserves, formation properties, and evaluation of hydrocarbon recovery. For instance, conventional well-log interpretation techniques often overestimate water saturation in organic-rich mudrocks, which is equivalent to significant underestimation of hydrocarbon reserves. Other examples include the unresolved mysteries about unexpected water production as well as challenging and inconsistent rock classification efforts. In this presentation, the impacts of rock fabric, composition, pore structure, and geochemistry on formation evaluation and rock properties such as wettability and mechanical/electrical properties of organic-rich muchrocks will be discussed. Outcomes of recent experimental and computational research developments as well as field applications will be presented to demonstrate that formation evaluation efforts for assessment of reserves and mechanical properties as well as rock classification can be enhanced by honoring realistic and quantitative rock fabric and geochemistry. Further impacts of these research developments include improved description of multi-phase fluid transport in spatially complex reservoirs with the intent to enhance production and recovery factors. Zoya Heidari is an Associate Professor in the Hildebrand Department of Petroleum and Geosystems Engineering at The University of Texas at Austin. Before joining The University of Texas at Austin, she was an Assistant Professor at Texas A&M University in College Station and the Chevron Corporation faculty fellow in Petroleum Engineering from September 2011 to August 2015. Zoya was the founder and the director of the Texas A&M Joint Industry Research Program on “Multi-Scale Formation Evaluation of Unconventional and Carbonate Reservoirs” from 2012 to 2015. She has been the founder and the director of the University of Texas at Austin Industrial Affiliates Research Program on “Multi-Scale Rock Physics” since 2016. She received a Ph.D. (2011) in Petroleum Engineering from The University of Texas at Austin. Zoya is one of the recipients of the 2017 SPE (Society of Petroleum Engineers) Cedric K. Ferguson Medal, the 2016 SPE regional Formation Evaluation award, the 2015 SPE Innovative Teaching Award, the 2014 TEES (Texas A&M Engineering Experiment Station) Select Young Faculty Fellows award from the College of Engineering at Texas A&M University, and the 2012 SPE Petroleum Engineering Junior Faculty Research Initiation Award. She is the holder of Anadarko Petroleum Corporation Centennial Fellowship #1 in Petroleum Engineering at UT Austin since 2016. Zoya has served as the Vice President of Education for the Society of Petrophysicists and Well Log Analysts (SPWLA) from 2016 to 2018. Her research interests include Petrophysics, Rock Physics, Borehole Geophysics, Formation Evaluation, Integrated Reservoir Characterization of Carbonates and Unconventional Resources, and Completion Petrophysics. Summary: "Everyone wishes to be ethical, thinks of themselves as ethical, and wants others to think of them as being ethical. However, being as ethical as we wish to be is more difficult than most of us realize." Click here for the power point. Full house of AGS members attended the annual ethics meeting by Dr. Prentice. Anaconda Minerals performed a heavy mineral diamond exploration program in the jungles of Indonesia during the mid-1980’s. Alluvial diamonds were known from the area and we were searching for the primary source of these diamonds. This photo log of the exploration shows the initial evaluation visit through the establishment of a “base camp” and use of various exploration methods. Many interactions with the native population are photo documented. One story tells of an emergency helicopter landing in a village of “headhunters”. Ultimately, the diamonds were traced from the alluvial terraces back to various older deposits. Some intrusives were tested, but all proved barren of diamonds. Abundant gold recovered led to the prospecting license being sold to an Australian Gold Company. Dennis was born in Philadelphia, PA and received a B.S. in Geology from Penn State University and a M.S. from Arizona State University. He worked in diamond exploration with Anaconda /Arco both domestically and in the jungles of Indonesia in the early 1980’s. Dennis continued his interests in diamond exploration in Arkansas during the late 1980’s when he was appointed as a technical advisor to the Arkansas State Parks commission on commercial mining at the “Crater of Diamonds” State Park. In 1993, he designed a regional diamond exploration program in Labrador, Canada which resulted in the discovery of the Voisey’s Bay Ni-Cu-Co deposit valued at over $100 billion. Early in 1995, Dennis opened the Diamond Fields office in St John’s, Newfoundland to oversee the exploration drilling and initiate the baseline studies for the project’s Environmental Impact Studies (EIS). In 1996, he returned to Arkansas to complete the economic evaluation of the “Crater of Diamonds” State Park. Dennis completed a Ph.D. on the Arkansas diamondiferous lamproites at the University of Texas at Austin in December 2002. From 2004, Dennis taught geology and environmental sciences at Austin Community College. In 2008, he was hired by the University of Texas at Austin to help write the earth sciences curriculum for a discovery-based course for future elementary teachers. He continues to modify and teach this ground-breaking curriculum at UT Austin. Structures and strata of south-central Laurentia record supercontinent interactions from Grenvillian orogenesis and assembly of Rodinia, to its fragmentation by rifting, to the amalgamation of Pangaea. Much of the critical evidence, however, lies deeply buried beneath Ouachita thrust sheets and younger strata. Late Proterozoic–Cambrian intraplate magmatism occurred along the eastern, western, and northern margins of the Laurentian craton. Whether similar igneous activity occurred prior to the rift-drift transition along the southern margin had remained uncertain. Our emerging zircon U/Pb data from the Marathon fold-thrust belt and the Devils River Uplift reveal that there were indeed Cryogenian (700-780 Ma) and Eocambrian (600-500 Ma) episodes of intraplate magmatism in this region (Hanson et al., 2016). Deformed as Pangaea was born, the Marathon belt thus provides new insight into the last days of Rodinia. Debris-flow deposits in Lower-Middle Ordovician sedimentary strata contain cobbles to boulders of unmetamorphosed basalts, trachyandesites and trachytes with intraplate geochemical signatures. A felsic tuff and a bentonite bed from the Marathon Fm. yielded zircons dated at 750-700 Ma (U-Pb, LA-ICPMS), consistent with the average crystallization age of ~706 Ma (U-Pb, SHRIMP, zircon) for trachytic/trachyandesitic clasts from the Ft. Peña Fm. The tuff and bentonite also contained 580- to 520-Ma grains, a suite not represented in the lavas. Detrital zircon analyses are under way to determine the source(s) of the oldest known sediments in the Marathon succession, the Upper Cambrian Dagger Flat Sandstone. New zircon LA-ICPMS data from Devils River Uplift core samples record both formation and fragmentation of Rodinia (Rodríguez et al., 2017). Zircons from Mesoproterozoic felsic gneisses yield uniform U-Pb crystallization ages of ~1230 +/- 5 Ma [cf. protolith ages of 1238-1232 Ma for Grenvillian granitic orthogneisses in Llano Uplift]. U-Pb data for overlying Lower-Middle Cambrian metasediments/metavolcanics, exhibit pronounced peaks at 700-780 Ma and at 500-600 Ma, as in the Marathon volcanic rocks. In sum, in southern Laurentia two episodes of intraplate magmatism, coeval with those on the eastern margin, contributed to Rodinia rifting and the opening of Iapetus. Reconstructing the tectonic history of southern Laurentia is Dickerson’s research focus: seeking the diagnostic evidence for Rodinia assembly and fragmentation (West Texas, Argentine Precordillera), Pangaea amalgamation (Marathon/Solitario fold-thrust belt, Ancestral Rocky Mts. ), Laramide foreland deformation (Big Bend), and Rio Grande riftng/transform faulting. She draws from those investigations in leading geological and natural history field seminars for students and professional scientists, as well as for Smithsonian groups. Pat has also served on task forces to develop scientific strategies for exploring the Moon and Mars. Research sponsors include NPS and NASA. Dickerson, P. W., 2003, Intraplate mountain building in response to continent-continent collision – the Ancestral Rocky Mountains (North America) and inferences drawn from the Tien Shan (Central Asia): Tectonophysics, v. 365, p. 129-142. 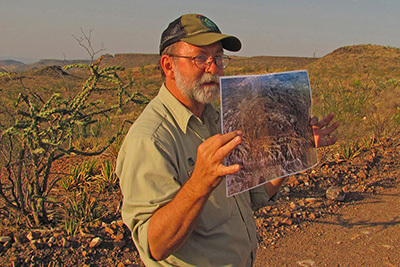 Dickerson, P. W., 2013, Tascotal Mesa transfer zone – an element of the Border Corridor Transform System, Rio Grande rift of West Texas and adjacent Mexico, in Hudson, M. R., and Grauch, V. J. S., New Perspectives on the Rio Grande rift: From Tectonics to Groundwater: Geological Society of America, Special Paper 494, p. 475-500. Dickerson, P. W., 2012, Hotspots, rifts, reefs, deltas, and cratonic basins – Views from space, in Roberts, D. and Bally, A. W., editors, Regional Geology and Tectonics: Principles of Geologic Analysis: Elsevier, chapter 9, p. 246-295. Muehlberger, W. R., and Dickerson, P. W., 2012, Geological methods, in Roberts, D. G. and Bally, A. W., editors, , in Roberts, D. and Bally, A. W., editors, Regional Geology and Tectonics: Principles of Geologic Analysis: Elsevier, chapter 8, p. 217-244. The 54th Forum on the Geology of Industrial Minerals (FGIM) annual meeting is being hosted by the Bureau of Economic Geology at the University of Texas at Austin and co-sponsored by the Texas section of the Society for Mining, Metallurgy & Exploration (SME). The conference will be held April 16–20, 2017. Events include presentations, excursions following half-day technical sessions, mixers, and 2 separate full-day field trips. Although oil and gas resources in crystalline reservoirs are not ubiquitous, they may comprise an under-explored resource globally. More than 100 fields with recoverable hydrocarbons in basement or volcanic reservoirs are documented in the literature. This estimate of the number of fields is likely a minimum because information on single well fields and fields in regions such as Russia and parts of the Middle East was not readily accessible. The first reported instance of oil recovered from igneous or metamorphic rocks is from an 1881 test of the Matembo Field in Cuba. Exploration and production of these reservoirs continues today with recent discoveries in the West of Shetlands, offshore U.K.. Of the fields and discoveries with reported volumes, we estimate a total recoverable resource of more than six billion barrel of oil equivalent (boe) from crystalline reservoirs with 13 of these fields each having more than 100 mmboe recoverable. 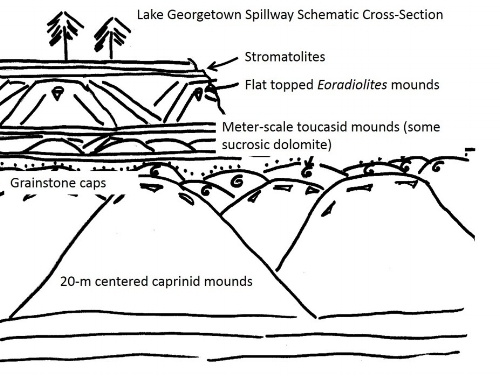 Trap types include geomorphic-origin “buried hills” and volcanic mounds; structural fault blocks, intrusive sills and laccoliths, “stratigraphic traps” of volcanic deposits and rarely, meteor impact structures. Of these, the “buried hills” are most common with some showing later structural modification. Productive reservoirs are largely dependent on the presence of conductive fractures and fault zones with a lesser component of inter-particle and secondary porosity reflecting diagenetic alteration associated with weathering and fluid flow. Top and lateral seals for most of the accumulations are marine or lacustrine shales with a few cases where impermeable volcanic, evaporite or tight limestone deposits have acted as seals. In some cases the sealing rock directly overlaps the crystalline reservoirs but in many cases, a sedimentary reservoir may overlie the crystalline rocks and in turn be overlain by the ultimate top seal (e.g. shale). Single well production rates from fractured crystalline reservoirs are field-specific and variable, but maximum oil production rates of individual wells can be high, for example, > 15,000 bopd. Similarly, hydrocarbon column heights vary but many of these fields have hydrocarbon columns exceeding 2000 feet. Many of the fields show pressure connectivity between wells, and these fields show tank-like characteristics which suggests that the fracture systems are connected. Average field porosity is typically 1-2% or less in basement accumulations typified by fractures but in volcanics and where diagenetically enhanced, local porosities can be higher. Field-specific porosities degrade with depth which may indicate a reduction in open fracture density or increased precipitation of cement in fractures. Interestingly, the porosity and permeability profiles for “buried hill” hydrocarbon fields are similar to present day basement aquifers that supply water in many parts of the world (e.g. sub-Saharan Africa, India). These basement aquifers typically show deep weathering profiles as a function of prolonged exposure and surficial or near-surficial weathering. These similarities suggest that the basement oil and gas reservoirs had similar origins. Key controls on basement oil and gas accumulations include proven hydrocarbon charge with adjacency to mature oil or gas kitchens, timing overlap of hydrocarbon expulsion and tectonic deformation/structural reactivation, and pre-conditioning of ‘basement’ by paleo-weathering. Mark Shuster (Associate Director: Energy Division) is responsible for managing the Bureau of Economic Geology’s energy-related research. Prior to joining the Bureau in 2016, Mark worked for Shell and affiliates for over 30 years in upstream oil and gas roles around the world includingexploration and appraisal projects in Latin America, Australia, the Middle East/North Africa, Southeast Asia, and North America including the Gulf of Mexico and Alaska. Mark received his Bachelor of Science degree in Geology from the University of the Pacific and his PhD in Geology from the University of Wyoming. Fluvially derived tuffaceous Chinle sandstones from Petrified Forest National Park provide a well-preserved Late Triassic archive of climate information. This study focuses on the relationship between climate and meteoric diagenesis as a guide for constraining climate change in western equatorial Pangea during the Late Triassic. Petrographic analysis of Chinle sandstones reveals their wide range of textural attributes, as well as pedogenic and shallow burial diagenetic features that occurred during the Late Triassic. These diverse petrological characteristics are indicative of the evolving Late Triassic climate, when placed into a well-constrained stratigraphic and geochronological framework. The stratigraphic succession is characterized by variations in the abundance of framework grains, detrital matrix, weathering intensity of feldspar and volcanic rock fragments, and the mineralogy of clay cements. Climate records from Chinle paleosol geochemistry indicate a progression from wet to dry conditions. This trend is also reflected in the meteoric diagenetic features of Chinle sandstones. During deposition of the lower Chinle, elevated rainfall promoted the weathering of labile volcanic detritus to kaolinite, whereas feldspars (especially plagioclase) were partially or completely dissolved. In the upper Chinle, a trend towards drier conditions favoured the formation of smectite and less feldspar dissolution resulting in a higher abundance of well-preserved plagioclase grains. Shallow burial meteoric weathering reactions in Chinle sandstones reflect the evolving climate during the Late Triassic. I did my Master’s at Michigan State University in glacial geology and my Ph.D. at UT Austin under the mentorship of Lynton Land, Earle McBride and Luigi Folk. I have been teaching sedimentary petrology and geochemistry at Baylor University since 1991. My research focuses on terrestrial climate reconstructions and the geochemistry of black shales. The central Andes are the locus of the highest magnitude shortening and crustal thickening along the Cenozoic Andean margin. In southern Peru, pre-Andean shortening and extension during the Paleozoic and Mesozoic, respectively, guided subsequent deformation. Late Permian shortening is evidenced by folds and reverse faults of variable orientation, potentially reflecting fold interference or changing stress orientation. These folds are covered unconformably by volcanic and non-marine siliciclastic rocks of the Triassic Mitu Formation. 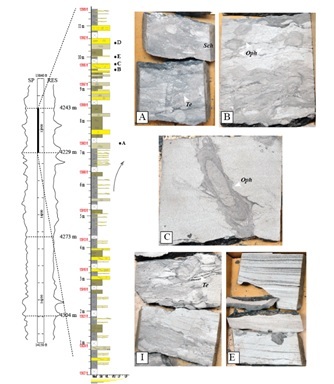 Lateral variations of facies, thickness, and fault patterns within the Mitu Formation suggest it is the stratigraphic archive of crustal extension overprinting Permian shortening. Although the magnitude and geodynamic drivers of these deformation phases remain debated, inherited structures from both events were selectively reactivated. During Andean orogenesis, the deformation front jumped from the Western Cordillera to the Eastern Cordillera in the Eocene, and potentially localized near pre-existing Triassic extensional structures. Thin-skinned shortening within the Eastern Cordillera reactivated inherited normal and reverse faults. One key structure is the Ayaviri fault, which defines the eastern Altiplano margin, and preserves growth strata constraining Oligocene fault motion. This structure has been variably interpreted as accommodating reverse or strike-slip offset, a reactivated pre-Andean fault, and as a boundary between suites of different volcanic products potentially reflecting contribution from different lithospheric blocks. Structural and magmatic observations from other segments of the Andean margin support variable influence from inherited structural architecture. These results emphasize how pre-Andean deformation may condition the crust for future deformation, as well as the continued need to characterize the role of inheritance on orogenesis. Nick’s research focuses on basin analysis and tectonics. His expertise is in non-marine siliciclastic sedimentology/stratigraphy, integration of U-Pb geochronology and provenance techniques, structural mapping and balanced cross-sections, and low-temperature thermochronology. His research topics include basin dynamics and sediment routing during deformation, the role of structural inheritance on subsidence and deformation, and the integration of sedimentology, geochronology, and kinematics. Nick is developing new research projects in the Peruvian Andes, Ancestral Rocky Mountains, Morocco, and the Cascades. Motivated students are encouraged to contact him if interested in M.S. or Ph.D. tectonics research. 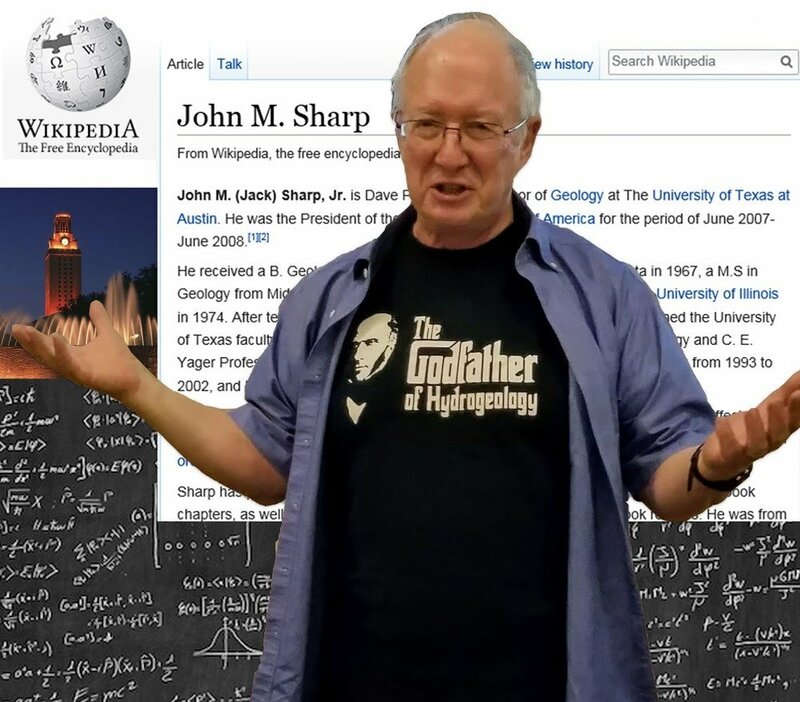 This fall is Dr. Jack Sharp's last semester to teach Hydrogeology at UT, and we would like to celebrate his spectacular career. Join us December 8 (Friday) at the Hydro Brown Bag seminar at the UT Jackson School of Geosciences and/or the BBQ Reception at the Pierce home to share exciting thoughts and reflections on our experiences with Jack. Dr. Scott W. Tinker is director of the Bureau of Economic Geology, the State Geologist of Texas, a professor holding the Allday Endowed Chair and acting Associate Dean of Research in the Jackson School of Geosciences at The University of Texas at Austin. Scott is past president of the American Association of Petroleum Geologists, the Association of American State Geologists, the Gulf Coast Association of Geological Societies, and the American Geosciences Institute. Scott is a Halbouty Leadership Medalist, a Boyd Medalist, and a Fellow of the Geological Society of America. He has given over 650 keynote and invited lectures to government, industry, academic, and general audiences, and visited nearly 60 countries. Tinker serves on many private, public, academic, and government boards and advisory councils and co-produced and is featured in the award-winning energy documentary film, Switch, which is on thousands of college campuses and has been seen by over 15 million people. He is working on another film project, Switch ON, focused on energy poverty. 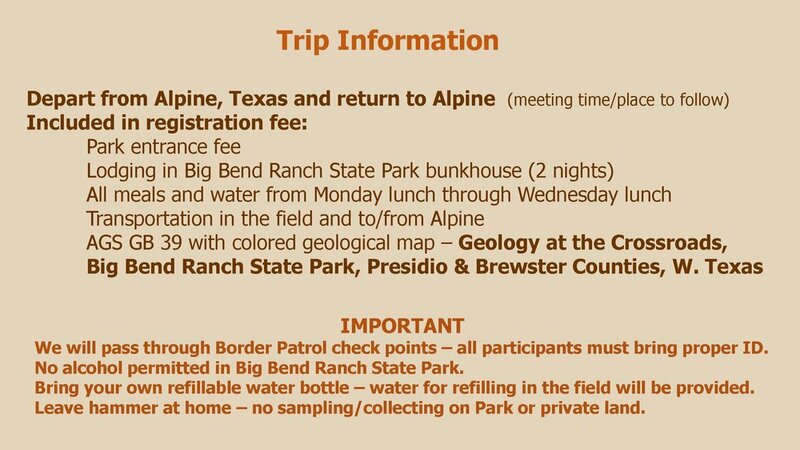 The fieldtrip participants will meet Saturday, November 18 at 9am at the small parking lot outside the entrance gate to the Corps of Engineers Cedar Breaks Park on the south side of Lake Georgetown. Cost per participant is $10 and can be paid on site. Bring field shoes, hat, sunscreen, and water; we will provide a printed field guide. Rest rooms are available in the park but not at the spillway. We will spend at least three hours on the excellent exposures of Albian rudist buildups in the spillway, but there is more of the Edwards/Comanche Peak section exposed to explore on your own. Macroeconomic modeling needs to consider a wide range of economic factors (employment, wages, economic output, capital, debt, income distribution) and physical factors (population, rate of energy consumption, capital). Most economic models focus on the former factors much more than the latter. The Long-term models also need to consider dynamics that have the ability to understand how the rate of change in the energy system interacts with the rest of the economy. In this talk, Dr. King discusses data and analysis that provide insight into the long-term (100+ years) changes in size and structure of the world and U.S. economy in the context of the size of the energy system. This topic has implications for modeling a transition to a low-carbon economy, a task for which many mainstream economic models (e.g., general equilibrium models) are ill-equipped. Carey is Research Scientist at The University of Texas at Austin and Assistant Director at the Energy Institute. He also has appointments with the Center for International Energy and Environmental Policy within the Jackson School of Geosciences and the McCombs School of Business. He has both a B.S. with high honors and Ph.D. in Mechanical Engineering from the University of Texas at Austin. He has published technical articles in the academic journals Environmental Science and Technology, Environmental Research Letters, Nature Geoscience, Energy Policy, Sustainability, and Ecology and Society. He has also written commentary for American Scientist and Earthmagazines as well as major newspapers such as the Dallas Morning News, Houston Chronicle, and Austin American-Statesman. Dr. King has several patents as former Director for Scientific Research of Uni-Pixel Displays, Inc.
by Blaine R. Hall, TPWD, Ret. Figure illustrating the geologic crossroads of BBRSP. Figure from TPWD. Deformation associated with the final stages of the formation of Pangea. All licensed geoscientists in the State of Texas are required to complete annual ethics training as part of their Continuing Professional Development. Given that all or most of the practicing geoscientists in Texas are honorable and dedicated at their profession, the question arises of what exactly are ethics in geoscience practice, what purpose do they truly serve and why are they required. Making ethical decisions about geoscience serves to protect the public we serve, society in general, and protects the good name of the geoscience profession. Working with a Code of Conduct standardizes expectations and actions of practicing geoscientists in a manner that is dependable and reliable for society at large. Approaches to making ethical decisions can be mapped out and followed to provide reproducible results. In the end, ethical practice and a professional code of conduct serve the interests of society, science and our professional standing. Note this meeting was rescheduled from August 28, 2017 due to Hurricane Harvey. Our thanks to Will for stepping in to provide an Ethics talk and get the year started. 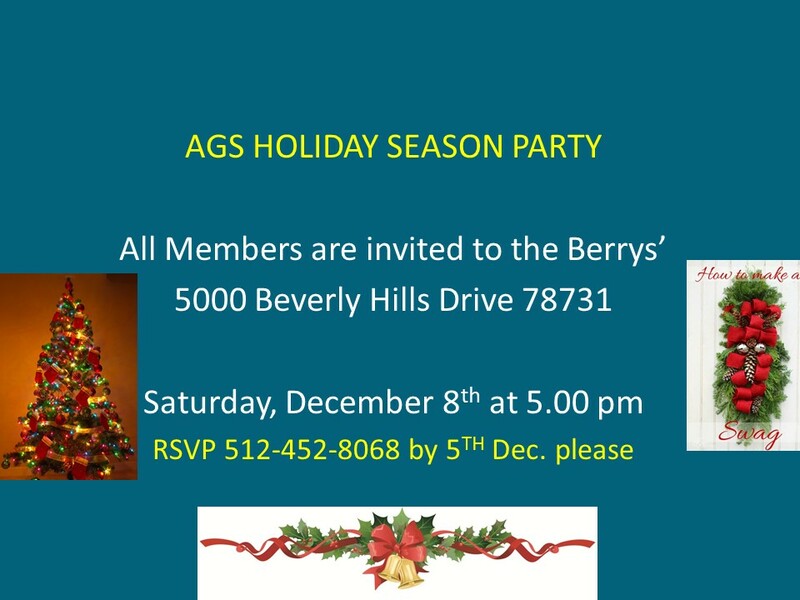 Due to uncertain weather conditions from Hurricane Harvey the AGS meeting will be postponed.